Bursitis is a painful inflammatory joint condition that can severely affect mobility, and can even be aggravated by movement of the joints in the affected area. The human body contains more than 150 bursae. A bursa is a tiny sac filled with fluid. Bursa is found near every joint. It reduces the friction between the bones and the tendons, thus helping the joints to move freely. Inflammation of bursa is called bursitis. Bursitis causes pain while moving the body. Bursitis mainly occurs on hip, ankle, knee, shoulder and elbow. Although the bursae are present near every joint, the major bursae are quite naturally situated around large joints, adjacent to the tendons. These would include joints like those of the shoulders, hips, elbows and knees. Elbow bursitis and shoulder, hip and heel bursitis are not uncommon, but the causes could vary depending on the location. At times the bursa can suffer inflammation on account of injury, or because of some underlying condition, but at other times the inflammation may also develop as a result of infection, but this is very rare in shoulder bursitis. Bursitis could develop due to various causes, and the causes and the location of the condition could be influenced by different factors. For example certain actions and routine movements that we normally take for granted such as bending down to tie a shoe lace or lifting a grocery bag could cause injury and inflammation of the shoulder bursa, while a scraping injury and bruising on the knee may cause infection of the bursa, resulting in knee bursitis, while the formation of gout crystals in the elbow could lead to inflammation of the bursa resulting in elbow bursitis. Bursitis isn’t the only inflammatory condition that affects the joint causing such pain and inflammation, limiting mobility, which is why it is not easy for a lay person to recognize the condition. It could easily be confused with arthritis, gout, and various other degenerative joint conditions. Some of the striking features of bursitis would be that the pain is typically localized and there would most likely be some tenderness and swelling in the area. Any attempt at movement of any of the tissues in the affected area would cause a great deal of discomfort and pain. In cases of chronic or recurrent bursitis, getting an X-ray test done could help as it could detect calcification in the bursa. Bodily movements and stress from movements that are highly repetitive are the most common cause of bursitis in the elbows. At times bursitis may also be caused by degenerative diseases or conditions like arthritis and gout or tendonitis. Age does also have a role to play as the tendons become less tolerant to stress and there is some loss of elasticity as well, making them more vulnerable to tear. As painful and troublesome as bursitis symptoms may be, bursitis treatment is really quite simple and uncomplicated. Diagnosing the problem is in fact a lot tougher. While a visit to the doctor is necessary for a proper diagnosis and also to find out about the various treatment options, you can also use certain basic home treatments for the condition to get some bursitis pain relief. The most important self care measure to control bursitis would be to get adequate rest. Whether it is bursitis elbow pain or bursitis heel pain that you are dealing with, the condition will always be aggravated by movement of joints in that area. In case of hip bursitis treatment, shoulder bursitis treatment and bursitis elbow treatment you can also use ice or rather cold compresses to relieve the pain and reduce inflammation or swelling. Painkillers may also be prescribed by your physician. You may also need to get ultrasound tests done, and physical therapy is absolutely essential. Bursitis treatment for the knees, shoulders, hips, elbows or for any bursitis symptoms in the shoulder or upper arm with natural methods would primarily imply treatment with physiotherapy. Elbow or hip bursitis exercises as part of the recuperative process are in fact an accepted procedure in conventional treatment plans. No matter what the causes of bursitis in the elbows, hips, knees or shoulders, health care providers across all disciplines agree that physical therapy and exercise is the most important element of a recuperative program that is meant to successfully rehabilitate the patient. At the same time it should be pointed out that there are specific exercises and physical routines meant to promote healing and you should avoid exercising and choosing exercise routines according to your whims and fancies. Exercises do involve repetitive movements too, and it is in fact possible that you may have acquired the injury that led to bursitis with such a practice. So avoid prescribing yourself an exercise regimen and seek the advice of your doctor instead. Stretching out and loosening the muscles with warm up routines is absolutely essential before any exercise routine to prevent injuries. Some of the symptoms of bursitis are as follows Mild pain in the affected area, The affected area will get stiff, Pain will get more intense while moving the body, Swelling in the affected area, Redness of the affected area, Burning sensation around the affected area. There may not be any visible symptoms of hip bursitis. The patient may feel pain at the femur or the greater trochanter. Activities that require overhead lifting or stretching can be extremely painful. The pain is usually intensified at night and you will also experience stiffness or a decreased range of motion in the affected shoulder. 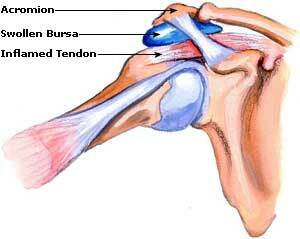 The pain is significantly intensified when the elbow is bent because of increased tension over the bursa. There are 3 major tendons in this region and depending on the bursa affected the symptoms may vary, but would include swelling before the kneecap, pain when the kneecap is bent and possible radiating pain towards the thighs or tenderness of the knee. The pain radiates down the front and middle of the thighs and intensifies when the hips are extended or rotated. Extension of the hips also increases pain and consequently longer strides cause more pain. You may even experience tenderness in the groin area. Ankle and bursitis heel symptoms will likewise cause in pain in the area of the foot, radiating from the affected joint, and intensified when the tendons are stretched or extended. Heel bursitis pain can be particularly severe. Heel bursitis can be cured with rest and physiotherapy and treatment for bursitis of the foot is essential, whether it is the heel or ankle affected, because of the severe impact on mobility. The primary reason for bursitis is repetitive stress or irritation of bursa. Sometimes arthritis, gout or an infection may cause bursitis. However, sometimes the reason for bursitis may not be known. Bursitis symptoms and treatment are affected by the causes of bursitis which is why it is important for you to understand the possible causes of the condition. Preventive measures can also be taken to great effect, if you understand the conditions and circumstances that increase the risk of developing bursitis. Soak a cloth in mullein tea and apply it on the affected area. Repeat this process at regular intervals. To reduce pain and inflammation, apply ice to the affected area. To prevent stiffness, apply lobelia oil to the affected joints. Chamomile, hops, and skullcap tea promotes healing process. Increase intake of calcium and vitamin B12 because their deficiency contributes to inflammation. Eat food that will provide plenty of magnesium e.g. leafy vegetables. Drink a mixture of water, apple cider vinegar and honey. Take enough rest to minimize the healing time. Apply ice pack to the inflamed area to reduce inflammation.